Hi, I'm Eugene Siegel and I currently attend Phillips Exeter Academy in Exeter, New Hampshire. I like working with computers and using them to create projects. I also love math a great deal. In my spare time, I enjoy learning about computer security and tinkering around with computers. 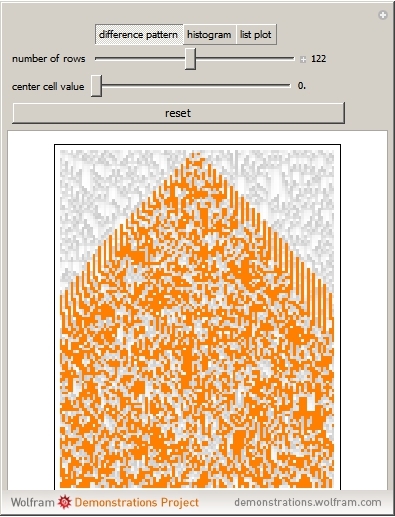 The rule used to generate the cellular automaton takes the two adjacent cells, multiplies their values together, and then subtracts this value from the original cell's value. This project demonstrates a difference pattern emerging from the top middle cell. There are sliders to adjust both the number of rows and the value of the middle cell from which the automaton is constructed. The reset button constructs a pseudo-random list of values to replace the first row of the automaton. On the second panel, one finds a histogram panel where the frequencies of color values are graphed, giving a visual probability of the distribution.